Today is the national feast day for Armenians all around the world. It is a holiday for the Armenians in Lebanon and Syria, and all of the shops and businesses in Bourj Hammoud, the Armenian neighbourhood in Beirut, are closed for the day — as are the offices and bookstore here at the Catholicosate. 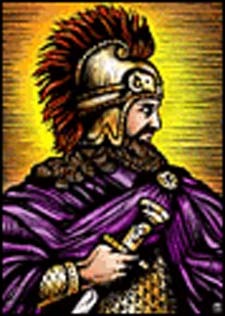 St. Vartan is the Christian general who led the Armenian troops (the Vartanants) against the Persians at the Battle of Avarayr on May 26, 451 A.D. The feast commemorating this great defining moment of the Armenian nation is now kept on the Thursday preceeding the Great Lent. In the 5th century, the Persians controlled the eastern part of Armenia (the Byzantine Greeks held the west), and Persian King Yazdigerd II (438-457) sought to impose Mazdeism, then the religion of Persia, on his Armenian subjects. It happens that the Persian religion had much in common with the pre-Christian traditions of Armenian, and was essentially a form of sun worship, with rituals involving the veneration of fire. The blessing of fire on the Armenian feast of Candlemas (see an earlier post on Derendas), apparently represents the Christianization of an ancient Armenian pagan festival centred on the veneration of a sacred mid-winter fire. However, there was no turning back to paganism for St. Vartan and the Armenian people who were united in their loyalty to the Christianity they had received from St. Gregory the Illuminator. As one, they rose to resist the advance of the powerful Persian army sent by the Persian king to impose Mazdeism on the Armenians, whether they agreed or not. Joining St. Vartan and his troops, were St. Leondius the Cleric (Ghevond, in Armenian) and his name sakes, the Ghevondian Saints. These were priests, bishops, and even the Catholicos of the day, who marched into battle against the Persians each carrying, as the tradition has it, a cross in one hand and a sword in the other. 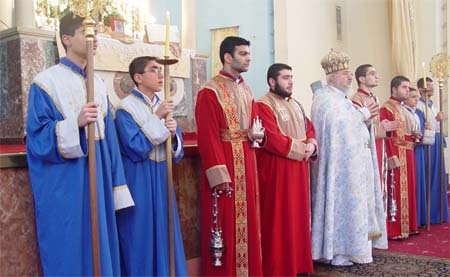 The Feast of the Ghevondians takes place on the Tuesday before the Feast of the Vartanants, and is a special day for the clergy of the Armenian Church. St. Vartan’s Day is a major feast, not just a holiday, and the schedule today at the Catholicosate was the same as it is on Sundays. 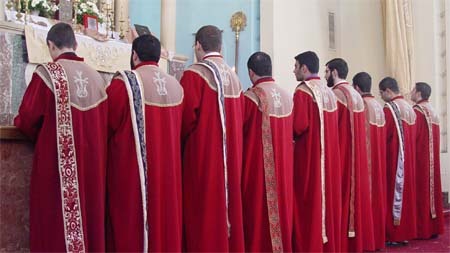 The Seminarians came down from Bickfaya for the morning offices, beginning at 8 a.m. and concluding two hours later when a group of seven deacons and two sub-deacons lined up for the closing chants before the “bema” or raised platform of the Armenian sanctuary. The deacons had a lot to do today, and this was because our celebrant this morning was a bishop, Serpazan Dirayr (Deer-rye-r), who is in charge of the Library here at the Catholicosate. (”Serpazan” is the title used for bishops.) Exceptionally, Bishop Dirayr wore the robes of a priestly celebrant today, and not those proper to a bishop. This is because Serpazan Dirayr was celebrating the 40th anniversary of this ordination to the priesthood, and to mark this milestone, he chose to dress as he did the first time he celebrated at the Divine Liturgy. Deacons have an historic and Biblical connection to the ministry of bishops, and the usual number of deacons at the Divine Liturgy (normally a deacon, or proto-deacon, and a subdeacon) was doubled today with two deacons working the incense and two serving as the deacons for the liturgy — one read the gospel, the other presented the gifts, both assisted the bishop-celebrant throughout). 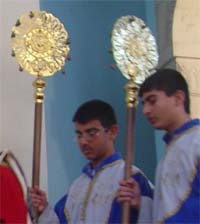 A distinctive set of instruments used in the Armenian liturgy are the round seraphim fans, made of brass with small bells attached. Whenever the choir sings during the Divine Liturgy the seraphim fans are rattled making a sound intended to represent the flutter of the six winged seraphim who “continually do cry ‘Holy, Holy, Holy’” (cf. Isaiah 6.2-3). Every community has its colourful people, and monastic communities often seem particularly blessed in this regard. If the monastic Brotherhood of the Catholicosate of Cilicia has an excentric in its ranks, then our celebrant today, Sarpazan Dirayr, is probably the one. He is impressive, to say the least! I recall visiting him once in the library where he sat behind his desk wearing a Russian fur hat (it was a little cold that morning), sipping Lebanese coffee, smoking a long cigarette, and very much holding court for the benefit of his assistants and the regular visitors in the library. He is much loved here, and a terrific celebrant and preacher. My limited grasp of the Armenian language only allowed me to catch the occasional word here and there of Sarpazan’s sermon this morning, but I can say that the dear bishop certainly managed to capture my attention! He uses his voice very effectively, with sounds ranging from stage whispers to deep stentorian blasts punctuated with great broad gestures of arms, all the while turning his small brass hand held cross like a conductor his baton. I assume his message today was to suggest that we, like the Vartanants, need to have the courage of our convictions; but I could be quite wrong about that!